Seeing has how I recently subjected my readers to an extensive rant regarding my thoughts on a significant swash of the Star Wars fandom, I thought it might be the right time to kick off a series I’ve been intending to write for a long time now. It’s my way of putting some positivity back into the Star Wars franchise by celebrating just how broad and diverse it is. Especially when compared to the handful of movies people seem to think this franchise beings and ends with. My intention here is to get my hands on and talk about every Star Wars video game I possibly can, and as chronologically as possible. I’m guessing it’s going to be more difficult to do this with some games than others, but I’ll cross those roads as I come to them. I intend to discuss the merits of each game on an individual basis, but not just that, I intend to dig into what the game added to the greater franchise, what other sources it pulled from and how it helped build the Star Wars into the huge multimedia behemoth it is today. So. As I mentioned before, Star Wars is much, much more than a series of movies. It’s been used in comic books, TV shows, video games, table top games and a ton novels. What makes the series unique is that everything published about in some form or another was able to slot into a singular lore. One that all fit together, in theory, and never contradicted itself without an explanation. Obviously, things have changed in that regard since the Disney acquisition. But I’ll talk about that some more when it becomes a factor in this series. 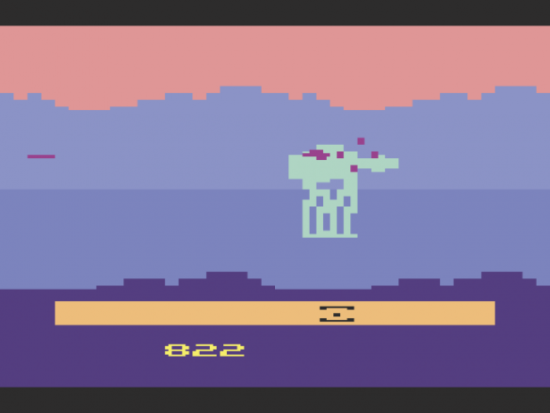 To begin, we’re going to start with the very first video game to bear the Star Wars title: Star Wars: The Empire Strikes Back for the Atari 2600. 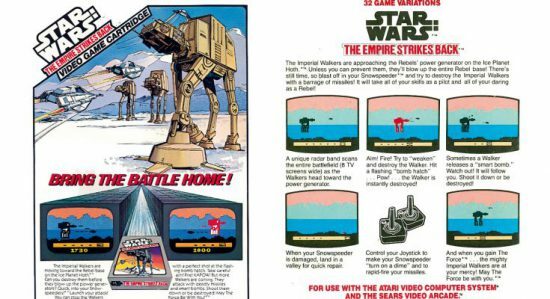 This first Star Wars game was released in 1982, just a couple of years after Empire’s release and a year before Return of the Jedi ended the original trilogy the following summer. It was at a point where Star Wars hype was at fever pitch, and marketing opportunities were rife and often guaranteed money makers. It was only a matter of time before someone got their hands on the licence and started putting some games out based on the series. Here’s the point where I would normally begin diving into the pros and cons regarding this game as a product and experience. I was after putting hands on the game that I realised that I am probably woefully under qualified to judge this game as anything but a relic from before my time. We all like to laugh at the younger generations and tell them how “hard we had it”, in the time before smart phones and internet access within arm’s reach at all times. I kind of feel like I’m the young child when playing this one. I started playing video games within the third console generation, on a master system, but my earliest genuine memories with in the forth with my Mega Drive. 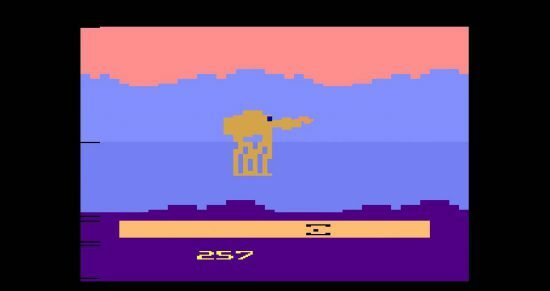 So, I struggle to come up with an objective opinion on an Atari game as anything other than an archaic novelty, but I’ll do my best to describe it anyway, and it’ll be a good point in which to come back to when talking about later games. The player takes control of Luke Skywalker in his snow speeder, attempting to shoot down Imperial Walkers as they slowly make their way from left to right, the right presumably being the rebel base. While the speeder looks like a mostly indistinguishable blob, the Walkers are rendered surprisingly well, moving with smoother motion than I had expected them to. Within moments of the game starting, I discovered just how naive I was, as my immediate thought went towards wondering if there was a way to use tow cables on the walkers. Sadly no, the only way to destroy the walkers is to shoot them in the cockpit/hit. And you have to do this a lot, a total of 48 hits being required to fell a single walker, and believe me, there are far more than just one to take down. The trick is being able to land the significant number of direct hits, while also avoiding crashing or being shot down by their heavy lasers. Your speeder can take more than a few hits also, and you go return to base for repairs, all in exchange for the time needed to take the walkers down as they slowly plod towards their target. This isn’t ever obvious in game, like many games of this era, very little is intuitive. For example, each walker has a bomb hatch you can open, and if you get a direct hit then the walker will instantly be destroyed. This is something I only learned about after the fact. This comes as a learning experience for me though. I need to find an old instruction manual and dig through those before playing these older games in the future. They were vital resources in playing a lot of these older generation games, which makes it all the more puzzling that so many of them got thrown away back in the day. Personally, it’s a game I can only get so much enjoyment out of. There is a purity to the simplicity of the game I can appreciate, but it’s so repetitive and surprisingly difficult that I didn’t see any value in playing it anymore than the 20 minutes I did in preparation for this article. Based on reviews and accounts of the game I found online, this seemed like something of a revelation to some back in the day. In the time when this was the peak of video game technology. But these games, to me, are simply too old to hold up if you don’t have any fond memories of playing them when the were new. There was some a variation to the game, with multiple game modes such as a “smart bomb mode” and a “solid walker mode”, as well as a combination of them both at the same time. It’s a high score game at the end of the day though, meaning there is very limited depth to it. 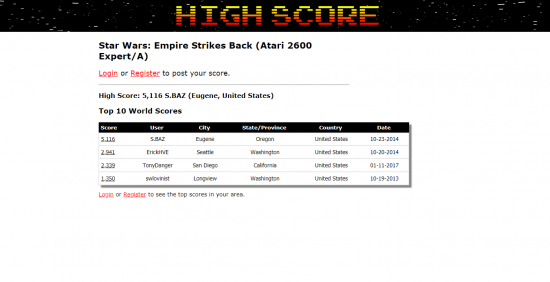 Unless, of course, you’re invested in the retro high score community, as recently as January 2017 a guy called TonyDanger managed to achieve the 3rd highest score for the game ever record. A huge 2,339, a far spell from the top score of 5,116. A score also set pretty recently, in 2014. After the game was already over 30 years old. That’s not the reason I, personally, come to video games though. So it’s limited how much I can get out of it. It might seem kind of unfair to say that, but this is ultimately my impressions and feelings about these games. I’m not going to say the game is bad, by any means, it’s just old enough that it’s impossible for me to talk about it in a vacuum. But hey, at least I’ll have something to compare the next couple of Parker Brothers Star Wars games to now. In terms of how this game went on to affect the greater franchise, individually, it didn’t. 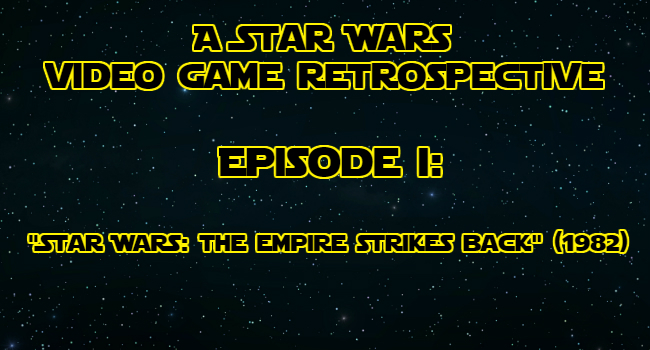 It’s most defining feature was the fact that it was the first Star Wars game. The actions of the game itself are little more than interpretations of the events within the Empire Strikes Back and nothing that appears in the game goes on to effect in the franchise. That being said, It’s a game that exudes the feel of Star Wars in any way in can given its limited medium. Between the walker designs, the music queues and aspects like hitting a narrow target on a larger enemy, it manages to do some things that do feel like Star Wars. The game was little more than a novelty for me personally, the most interesting thing about it being its presence as the first game to depict star wars in a way outside the movies. And to be honest, if you changed the music, you would struggle to recognise it as a Star Wars at all. Next few parts of my retrospective will cover the other Atari games that the Parker Brothers released. They might be shorter entries, depending on how much I get out of them during my research and when playing them. I’m going to put these out on a semi regular basis, I haven’t decided if they’re going to have a dedicated release schedule or not right now, so I’ll just be surprising you for now. 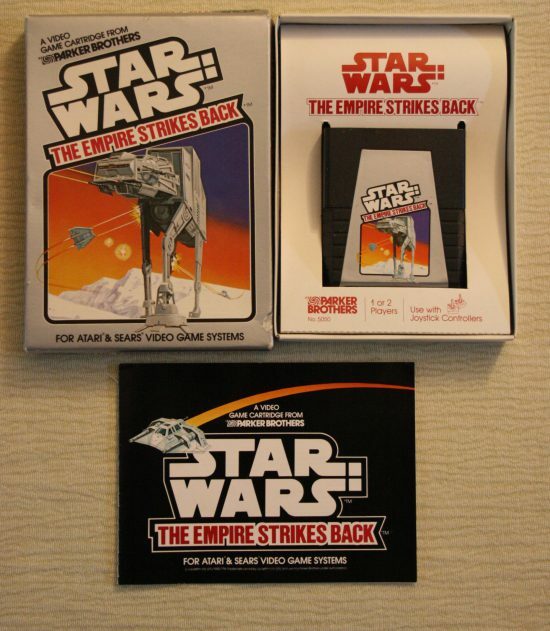 Posted on August 6, 2018 August 2, 2018 by WooderonPosted in Star Wars, Video Game RetrospectivesTagged atari 2600, empire strikes back, lucasfilm, retro, second console generation, Star Wars, star wars video game retrospective.